I created a bracket using 2016-17 data (the most recent available through the U.S. Department of Education for the net price of attendance for all first-time, full-time students receiving grant aid I should note that these net price measures are far from perfect—the data are now three years old and colleges can manipulate these numbers through the living allowance portion of the cost of attendance. Nevertheless, they provide some insights regarding college affordability—and they may not be a bad way to pick that tossup 8/9 or 7/10 game that you’ll probably get wrong anyway. Kudos to Northern Kentucky for having the lowest net price for all students ($9,338), with an additional shout-out to UNC-Chapel Hill for having the lowest net price among teams that are likely to make it to the final weekend of basketball ($11,100). Not to be forgotten, UNC’s Tobacco Road rivals Duke deserve a shoutout for having net prices below $1,000 for students with family incomes below $48,000 per year even as the overall net price is high. As a closing note, this is the first NCAA tournament for which gambling is legal in certain states (including New Jersey). I can’t bring myself to wager on games in which student-athletes who are technically amateurs are playing. If a portion of gambling revenues went to trusts that players could activate after their collegiate careers are over (and they do not benefit from a particular outcome of a game), I might be interested in putting down a few dollars. 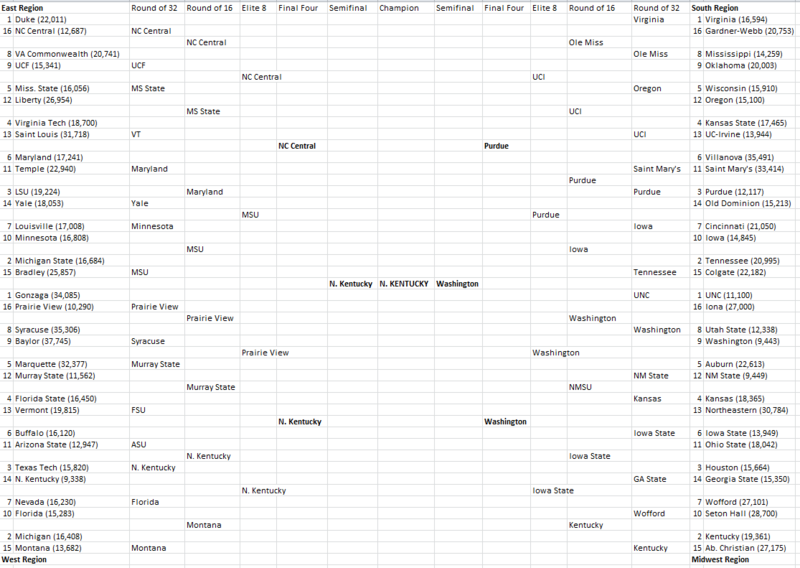 But until then, I will use this bracket for bragging rights and educating folks about available higher education data. Previous Previous post: A Possible For-Profit Accountability Compromise?